I’ve talked a lot about bombers/silk bombers in recent weeks, but truth be told up until very recently I hadn’t found one that I’d personally fallen in love with! It’s been kind of a strange secret hunt… like finding a boyfriend in LA. (I mean hey, I managed to find one finally, but I know what it’s like out there.) I’ve had a very “Goldie Locks” attitude towards the whole thing because if I’m going to wear print (for one), and I’m going to invest in another statement piece, it better be perfect. Right? Right. So, as the story usually goes, I walk in to Zara and found my “sateen” soulmate. Of course it ended up being behind a pile of other clothes, had no price tag, and was the only one of it’s kind in the store – so CLEARLY it was meant to be. 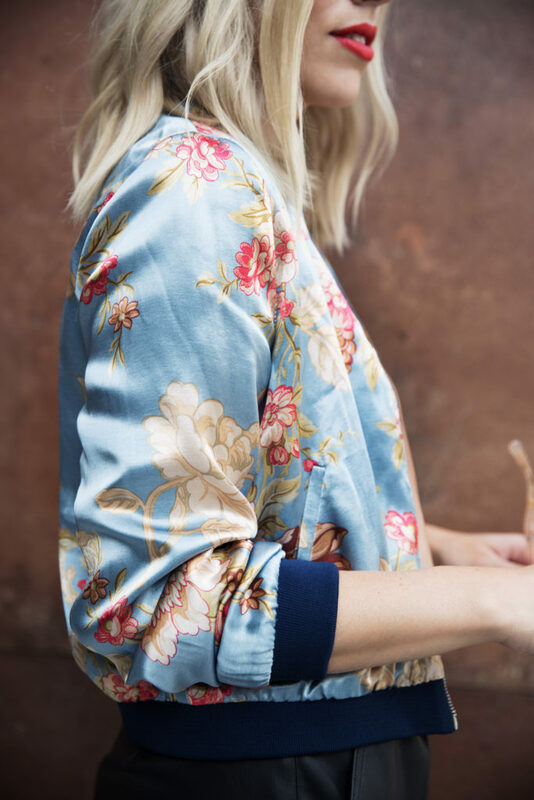 There are so many great prints out there and so many great silk bomber styles; I’ve found the usual suspects Topshop and Zara to have the best and most affordable options. 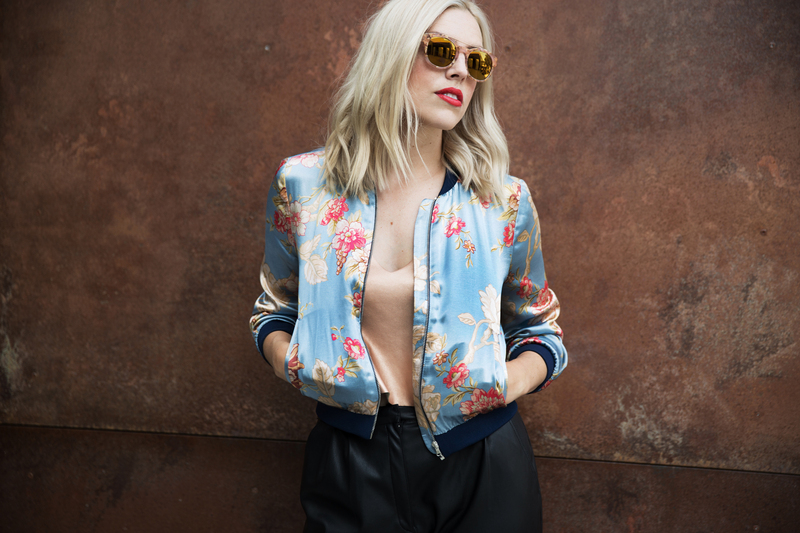 Whether you want to go minimal/simple or fun and colorful, there’s a silk/sateen bomber out there with your name on it. I’ve paired this with everything from a casual pair of high waisted shorts and sneakers to a black slip dress, and even pleather trousers and heels (as seen above). With a bold statement jacket like this I tend to try to keep the rest of my outfit simple with plain tops and basic bottoms. This with a classic white t and jeans will never fail. But for the sake of wanting to dress up my new cool jacket, I upped the ante with a rose gold crop top, a pair of heels, and some red lips. Looks like I’m goin’ out tonight! TOP: Zara – Metallic Faux Leather Top – on sale for 12.99!